Mastering the Floral Design - A Step By Step Guide. A Step by Step Guide for Fast and Easy Floral Arrangements. Flower arranging made simple. Mastering The Floral Design is a beautifully presented, step by step guide for the use of the Floral Design Flower Arranging System. The easy to follow instructions, combined with full color photographs make this book a must have for any flower enthusiast. Learn to make a perfect looking arrangement for every major holiday and special event of the year. In just minutes, any novice can create beautiful arrangements with fresh flowers, silk flowers or even dried flowers that look like expensive bouquets, made by a professional florist. As a special bonus we have also included a food presentation with each category to illustrate the incredible flexibility of the Floral Design. 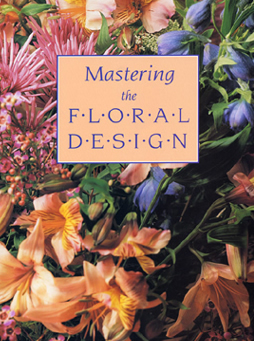 Mastering the Floral Design is not only a comprehensive guide to flower arranging, this book also contains valuable information on the care, preparation and buying of flowers, as well as tips on food preparation for use with the Floral Design. Whether you are a novice or a professional, we guarantee you will receive rave reviews with your styling results, and have fun creating them. Once you have mastered the book, the sky is the limit, the possibilities are endless and we know you will enjoy the challenge. This book will give you the foundation you need to create an endless amount of professional quality flower arrangements. After much encouragement from their devoted fans, the Horticultural Institute of Southern California has produced Mastering the Floral Design a photographic display of seasonal and special occasion arrangements all created with the Floral Design. For your convenience they have designed each page to reflect a theme which is demonstrated with arrangements made of silk flowers, dried flowers, fresh flowers and fresh fruit. The arrangements are easily recreated at home by following the step by step instructions included with each photograph. Order Your Copy Today! Mastering The Floral Design is an easy to use, step by step guide. Learn to create an assortment of beautiful bouquets. Save Money and look like a pro. Buy Yours Today! What great ideas? I didn't realise how many wonderful arrangements were available for my floral design vases. Should have bought this book years ago!! An Easy Way To Move Big Objects. A Scented Oil With Spicy Undertones. Use with Warmers, Misters and Diffusers. A Light, Flowery Scent With Earthy Notes. Use In Warmers, Misters, Soaps & More. Perfect for shallow water applications. A high quality mist maker with one red LED.